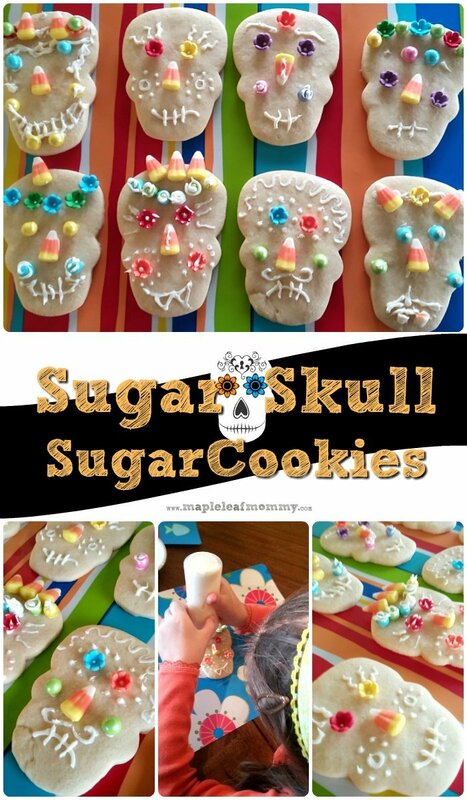 The kids loved the cookies I made for Halloween especially the skull cookies. 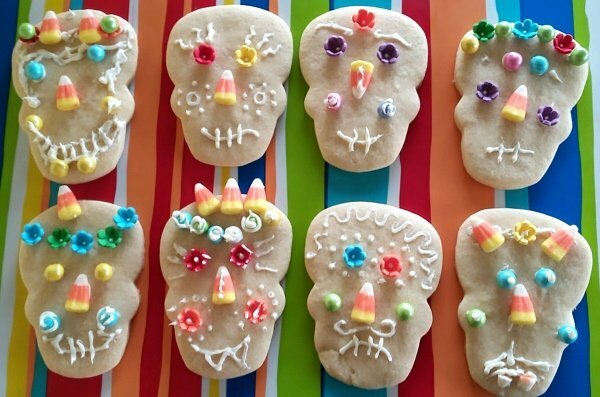 They were actually quite easy to make so we got together and they decorated their own Day of The Dead Sugar Skull Cookies. After cutting out and baking our cookies we let them cool and set up our decoration station at the dining room table. We put the decorations in bowls and set them on the table with a placemat for each kid. 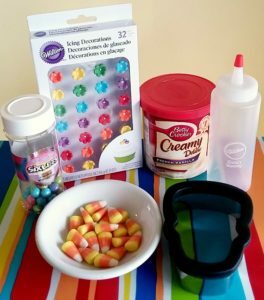 The kids took their baked, cooled off cookies and planned out what items go where before they used the frosting to glue the items down. Just a little dab of frosting is all you need to make them stick on. Start off with just the candy corn nose and either flower or chocolate candy eyes, and then I let them get a silly. 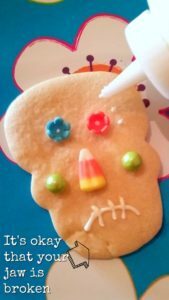 After attaching the eyes and nose, each skull got their own frosting mouth and some extra frosting and candy decorating. The squeeze bottles worked out perfect. I’m not kidding when I say they are easy to make. It’s okay if the dough doesn’t look perfectly smooth. Those aren’t cracks; they’re skull fractures. Skull fractures add character. We ended up with vampire skulls, skulls with flower crowns, skulls with part hats, and a whole assortment of silliness. You could really use any kind of candy or cake decoration. Get creative. This was what I had on hand but I could have easily used M&Ms or some other leftover Halloween candy. 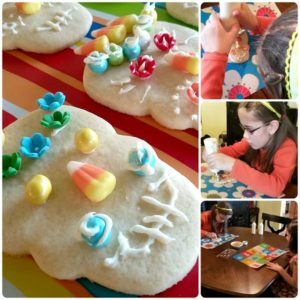 If you are looking for a kid friendly cookie decoration idea I would recommend this. My only warning: there was leftover frosting galore, but that’s fine by me. Even after all the extra swirls and dots I used less than 1/3 of a container of frosting. Looks like I’m going to have to bake something else and use that frosting up. Oh no! So simple and so much fun. Using squeeze bottles was a great idea. Each cookie is unique…like a little piece of art. Great job girls! I really like this idea!! I think it’s a great idea and I am totally stealing it next Nov!!! These cookies would be great fun to make. Thanks for the idea. Love these we made something similar for Halloween! They turned out so awesome! I love the creativity in these cookies.